You’ll love the refreshing sparkly taste of this mixer. Add water to drink mix in large plastic or glass pitcher; stir until mix is dissolved. Stir in ginger ale just before serving. Serve over ice. This recipe is made with ingredients that contain no labeled sources of gluten. However, if your personal dietary goal is to strictly avoid gluten, be vigilant. Always read ingredient statements on food labels for the most current and accurate information for every recipe ingredient. And when working in the kitchen, use gluten-free preparation methods and utensils. For individualized advice, check with a certified health professional or credible source. Add a fresh raspberry to each glass before filling with prepared drink. 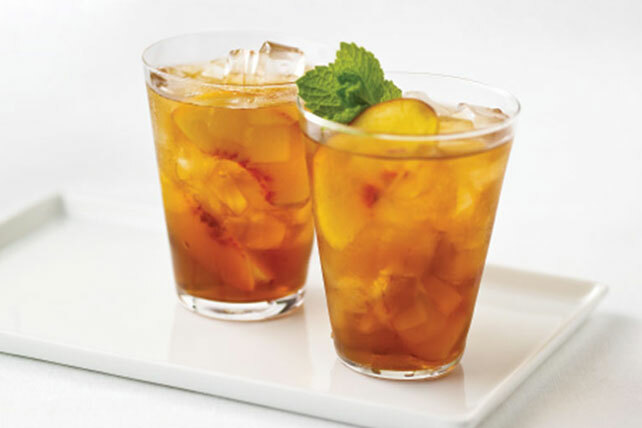 Garnish each glass with a fresh peach slice.